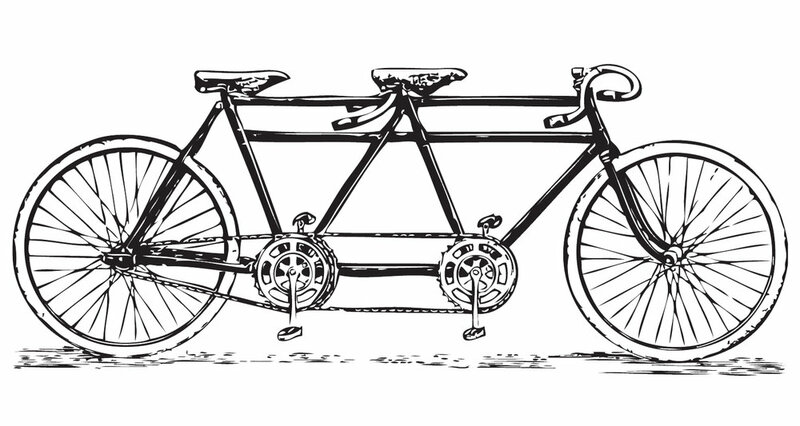 Boneshaker's handy safety tips for biking comfortably in pairs. Hooking Up: The most essential step in locking frames together is, of course, having the proper protection. We suggest a 7-foot looped security cable and one large U-lock, both of which are guaranteed to keep you safe and satisfied. While you may have found your perfect position for locking up solo long ago, it might take some time for you and your significant other to find that sweet spot. Our best advice is to keep experimenting until it feels right. There are many positions out there to try (such as the side-by-side and the double-loop-double-lock), but you’ll just have to see what’s perfect for you once you’re at the bike rack. And if all else fails, just remember that opposites attract. Sending Signals: If you’ve ridden with your biking partner before, you may have noticed he or she sending some signals to other folks on the road that you don’t necessarily understand, or like. Perhaps some may even clash with your own hand, eye, and mouth gestures, which can be confusing for you and for others, too. If you’re planning to ride alongside this person long-term, however, we suggest sitting down together and deciding what signals work well for both of you. It might also be a good idea to discuss which signals mean what in certain contexts, so as not to inadvertently send mixed messages to other riders or each other. And remember: safety and smoothness are the primary goals! Getting On: Mounting your bikes simultaneously can sometimes be tricky, especially when you’re both headed in the same direction on the same road at the same time in the same small area. What with legs being raised over saddles, trying to keep balanced, and getting up one’s momentum, it can be a wild few seconds at the start of the ride. On rare occasions, you should be aware that riding together has even been known to cause injury to one or both riders if done improperly. Once you’re going, though, we are sure with enough practice you’ll find a harmonious rhythm. Until then, give each other some space, consideration, and patience. In no time, you’ll be getting on successfully.